Some journalists and commentators have been referring to the citizen uprisings in the Middle East as the "Arab Spring," adapting the term "Prague Spring," which referred to the liberalization of Czechoslovakia in the first half of 1968. While the "Prague Spring" and the "Arab Spring" differ in important ways, they do have one important element in common: one sought and the other seeks to peaceably inject elements of democracy into deeply authoritarian systems. Unlike the present Arab citizen uprisings against long-time rulers, the Prague Spring was initiated by newly selected leaders of Czechoslovakia. The efforts were widely supported by citizens, but raised the concern of the leaders of the Soviet Empire into which Czechoslovakia had been thrust after World War II. The Prague Spring was initiated by Alexander Dubcek, who became First Secretary of the Czechoslovakian Communist Party in early January, 1968. Dubcek's actions were supported by Ludvig Svobota after he became President of Czechoslovakia in late March 1968. The proposed economic and social reforms came after a long period of stagnation, and they followed calls for changes by several brave intellectuals who risked jail by speaking out. Dubcek's action program called for more freedom of the press, freedom of speech, and freedom of movement. He suggested that multi-party government would be possible in the near future. He proposed re-orienting the economy to give consumer goods more priority. Dubcek called his reforms, "Socialism with a human face." He and his government began to implement this reform plan in April 1968. When the Prague Spring was taking form, I was a student in Vienna, which is about a four-hour train ride from Prague. The changes in Czechoslovakia were exciting for Austrians, but also created anxiety: they remembered what had happened in Hungary in 1956 when the Hungarians had rebelled against the Communist system. In late April, my university, the Institute of European Studies, arranged for interested students to travel to Prague to see the city and to observe the traditional May Day Parade, a big celebration in communist bloc countries. I eagerly signed up for the trip, and thus was there on May 1, 1968 for the happy celebration of the early days of the Prague Spring. While there, I took the pictures shown in the post. I am no expert on what usually happened at May Day parades in communist countries, but from what I was told by people in Prague, this parade generated much greater excitement among the participants than the usual May Day parades. While it had a plethora of red flags, they did not have a hammer and sickle. Many marchers had signs with the word "Demokracie" on it. Some marchers carried signs with Dubcek's picture on it; very few or none (I didn't see any) carried signs with pictures of Brezhnev or Lenin. This 1968 May Day was impressive for the numbers of people with flags and signs who paraded through the city of Prague. Several of the marchers carried young children on the shoulders. The atmosphere seemed jolly. This apparently was a time of great hope for the marchers. They had a government that offered freedoms that had been missing since this country had been sold out to the Nazis in 1938. The new government held out the possibility that Czechoslovakia would be able to rejoin Europe and regain the level of prosperity that it had had in the 1920s. Of course, all of the hopes were smashed on August 20, 1968 when 200,000 Warsaw Pact troops and 2,000 tanks rolled into the country. The invasion -- which was not resisted by the Czechoslovakian military -- removed Dubcek from power and reversed the democratic reforms. The Prague Spring experience makes me a bit pessimist that the Arab Spring will, in the short run, achieve the desired democratic changes and liberalization of society. 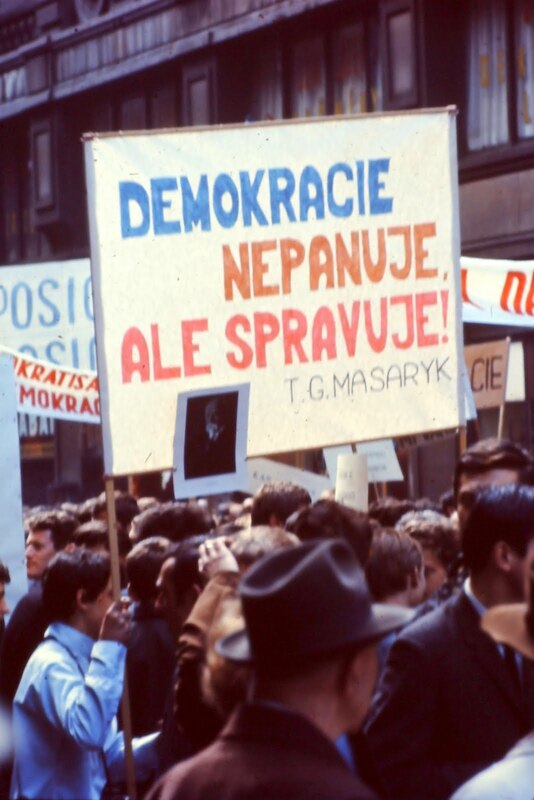 However, we can hope that the citizen uprisings will, as with the Prague Spring, contribute in the longer term to better lives for those who desire more freedoms and fuller integration with the rest of the world. I have found a couple of additional pictures of the May 1, 1968 May Day Parade in Prague. One of the pictures contradicts a statement above that the Lenin's picture was not carried in the parade. As the picture below shows, at least one picture of Lenin was in the parade. The second picture shows a boy sitting on the shoulders of his dad, holding dearly onto his hair.